hosts for 286 in the first innings. 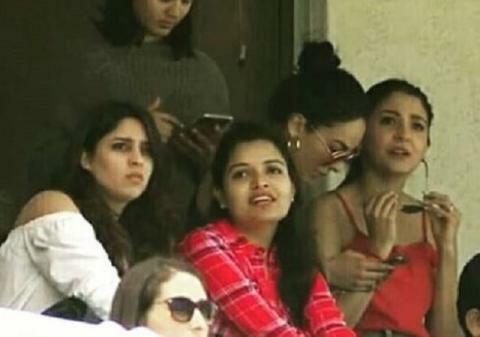 It was the last hour of the day which didn’t go India’s way but the cricketers’ wives, who were present in the stands, cheering for their husbands throughout the day. Among those who were present, the name which caught everybody’s attention was skipper Virat Kohli’s wife Anushka Sharma. India’s innings on day 1, however, rather disappointing as Virat Kohli's perennial weakness outside the off-stump was once again exposed. In their 11 over burst during the final hour, the South African trio of Vernon Philander (1/13 in 4 overs), Dale Steyn (1/13 in 4 overs) and Morne Morkel (1/0 in 2 overs) troubled the Indian top-order with bounce, seam, and swing. Murali Vijay flashed at an away going delivery from Philander while Shikhar Dhawan found Steyn's pace too hot to handle going for a pull shot on a delivery that climbed on him. Skipper Kohli, who has had serious problems with moving deliveries on the 'fourth stump' found Morkel getting one to rear from the back of the length with a shade away movement. Just like England tour of 2014, Kohli fished at the delivery to find Quinton de Kock gobble up the prize catch. This was after Indian bowlers led by Bhuvneshwar Kumar (4/87 in 19 overs) had South Africa 286 all out in 73.1 overs -- a total India would consider as 50 too many after the UP seamer had the Proteas reduced to 12 for 3 inside six overs.